From the early days of Guiding it became clear that there would need to be a national structure for Guiding. 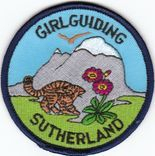 It was decided that there should be a County Commissioner in each local authority area, who would have responsibility for organising Guiding in her patch, recruiting suitable help and managing the opening of units and the training of Leaders. 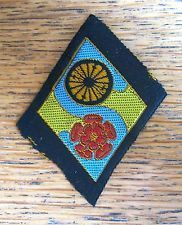 In England each County was allowed to have a County badge, this was not the case in Wales, Scotland or Ireland, each of which had a Country badge. 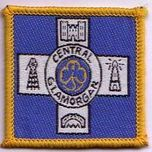 In recent years many of the Counties in Wales, Scotland and Northern Ireland have produced County patches for their members too. The list below gives Counties, and County badges, plus a little information on each County. It will be added to as information becomes available - contributions of information or images welcome! On vert, a dragon passant gules. The badge of the principality of Wales. The Silver Penny. The badge is a copy of a coin struck in the reign of Edward the Elder (899-925 AD) to commemorate the victory over the Danes who came up the Ouse towards Bedford, and features Edwards name in Saxon. It was found over 100 years ago. On a motto scroll lettered BERKSHIRE a stag standant eating from an oak tree, all or. The stag and oak tree is an old county emblem which alludes to the forest of Berkshire which were used for hunting by Saxon and Norman Kings. On a wreath or, a mural crown of the first charged with a rose gules. 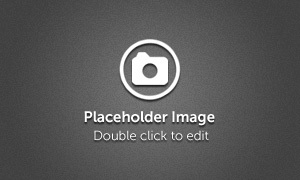 Issuant therefrom a dexter arm embowed, the hand holding a hammer, all or. Inscribed beneath on a scroll , FORWARD lettered or. This coat of arms is derived from the crest of the Birmingham city arms, the hammer representing the importance of industry in the city. Per Pale gules and sable, a swan rousant proper, ducally gorged with chain reflexed over the back, or. This is the swan of the Earls of Stafford, who later became Dukes of Buckingham. A lozenge pale blue with a three-flowered spray of Madonna lily proper, enfiled with a crown or. The three lily flowers, representing the purity of good womanhood, recalls the threefold Promise. As in the World Flag, the blue background represents the sky. The crown is the 'Crown of Righteousness' to be given to all those who love the Lord's appearing (Christian Bible Timothy II chapter 4 verse 8). The stem symbolises the green leaves sprouting from St Etheldreda's staff. According to legend Etheldreda, Queen of Northumbria, founded a monastic community on the Isle of Ely. One night, on her journey to Ely, she thrust her walking staff into the ground and lay down to rest beside it. When she awoke, the staff had sprouted leaves. The crown is now part of the arms of Ely, the pale blue is the traditional colour associated with Cambridge University, and the lillies a link with St Etheldreda. A lion rampant azure, eyed and langued gules, grasping a garly or in his forepaws, standing upon a scroll lettered CHESHIRE BORDER gules. The garly appears in the arms of many Cheshire families, being an ancient badge possibly dating back to the 1200s. When the county of Cheshire was split in the 1970s, the new County's boundaries closely resembled those of the old Macclesfield Hundred, so the blue lion rampant badge of that area was incorporated in the Guide County badge. A garly bound with a motto band I SERVE, inscribed beneath CHESHIRE FOREST on a motto scroll, all or. A lozenge azure quartered by a cross yellow throughout, 1 and 4 a barry wavy white, 2 and 3 the white rose of Yorkshire, all fimbrulated argent. Sable, fifteen bezants in pale, the shield ensigned by the coronet of the Heir Apparent, inscribed beneath the motto band lettered or ONE AND ALL lettered or, above lettered CORNWALL or. There are various legends attached to this coat of arms which belongs to the Heir Apparent as Duke of Cornwall, it is the arms of the Duchy of Cornwall. The cross represents the cross of Carlisle Priory. In the County badge the two top roses are the roses of Lancaster and the bottom ones the roses of York, in the original arms, however, the five roses were all red and white. The Curlew is a common bird in Cumbria, often heard if not seen, on the fells and by the sea shore. The badge was adopted in 1924, and redesigned in 1945. Above a rose gules seeded or, barbed vert, a Royal Crown or. Inscribed beneath on a scroll very DERBYSHIRE lettered or. A crowned red rose has been the emblem of the Duchy of Lancaster since ancient times and was used as the Lancastrian emblem in the wars of the roses. 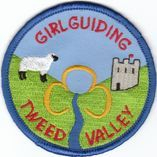 On a roundel green, bordered white, lettered DEVON GIRL GUIDES argent, al triangular castle argent, the white surrounded by rays argent in the form of an eight pointed star. The badge is derived from the badge of the Devonshire Regiment. A castle embattled and triple-towered white, charged with an escutcheon gules, quartered 1 and 4 semee of fleur-de-lis and 2 and 3, three lions passant in pale or. 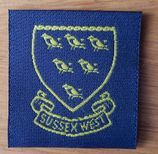 The badge derives from the ancient seal of Dorchester. It must date from between 1340 and 1405. A lozenge azure, quartered by a cross throughout or, on each quarter a lion rampant or, a scroll argent DURHAM NORTH lettered sable. These arms derive from the traditional arms of the Saint King Oswald. The cross is that of St Cuthbert and also marks Oswald's work for the spread of Christianity in Northumbria. A lozenge azure, quartered by a cross throughout or, on each quarter a lion rampant or, a scroll COUNTY DURHAM BADGE lettered or. The white rose of Yorkshire, seeded yellow, barbed vert. A seaxe pommelled and hilted or. This derives from the Essex County arms, which is gules, 3 seaxes fess wise in pale argent pommelled and hilted or, pointed to the sinister and cutting edge upwards. Issuant from a mural crown, a demi lion guardant gules, holding in his dexter paw a broadsword and in his sinister paw a trowel proper. Inscribed beneath on a scroll gules the word GLOUCESTERSHIRE lettered or. This is taken from the crest of the city of Gloucester, slightly differenced. Gloucester's ancient trade was wrought iron work, and the trowel may refer to this. On a lozenge azure a white horse forcene above the word INVICTA lettered or. The white horse is said to be derived from the standard of Hengist and Horsa since both names mean horse. Vortigern the British King was captivated by Rowena, Hengist's daughter. In return for being allowed to make her his Queen, he created Hengist King of Kent, and the white horse forcene has appeared on the arms of Kent as a result. Invicta, meaning unconquered, is a description of the inhabitants of Kent traditionally ascribed to William of Normandy. They parleyed with him, offering him their loyalty in return for being allowed to retain their ancient laws and privileges. On a lozenge gules a tower with four turrets and pennons white standing on three bars wavy azure fimbriated argent. The tower is a representation of the White Tower of the Tower of London, and the bars wavy the River Thames - the London River. A rose gules for Lancashire inscribed beneath MANCHESTER on a scroll gules lettered or. Gules, three lions passant or in pale on a shield argent the name GUERNSEY lettered or, issuant from the centre chief three leaves or. The Channel Islands being a dependency of the UK and the sole remaining portion of the Dukedom of Normandy still appertaining to the crown. The County Badge is differenced by the addition of the chief and the crest of leaves. A rose argent surmounted by a royal crown. Inscribed beneath on a scroll HAMPSHIRE EAST lettered or. The County badge is derived from the Hampshire County Council's device. A rose argent surmounted by a royal crown. Inscribed beneath on a scroll HAMPSHIRE NORTH lettered or. A rose argent surmounted by a royal crown. Inscribed beneath on a scroll HAMPSHIRE WEST lettered or. A lion passant guardant white, holding in the dexter paw a sword erect pomelled and hilted or. Inscribed beneath on a scroll sable the motto INVICTAE FIDELITATIS PRAEMIUM lettered or. The lion and motto are taken from the arms of the city of Hereford, as granted in 1645. The lion signifies strength and courage, the sword, readiness to defend the King and fight for truth and justice and the motto indicates that loyalty brings it's reward. On a roundel azure a hart lodged proper above barry wavy of 6 azure and white. The badge is derived from the ancient seal of Hertford - a hart in a ford. The barry wavy represents the many rivers in the County. On a roundel or, three legs armed or, conjoined in the fess point at the upper part of the thighs flexed in a triangle, garnished and spurred or, lettered ISLE OF MAN or. On a shield a castle or, inscribed beneath on a scroll VECTIS lettered or. The castle represents Carisbrooke, once the capital of the island. Vectis is a Roman name meaning a separated region. Gules 3 lions passant guardant argent on a chief gules JERSEY lettered or. On a shield gules a white horse forcene. Inscribed beneath on a scroll sable the words INVICTA KENT lettered argent. On a lozenge gules, a white horse forcene, and in the base the word INVICTA lettered argent. On a shield azure, a white horse forcene. Inscribed beneath on a scroll azure the words INVICTA KENT, lettered argent. On a lozenge azure bordered or, a Lancashire Rose gules, fimbriated or. A rose gules barbed vert, behind a witch on broomstick or. This derives from the Red Rose of Lancashire, famed from the wars of the roses. The Pendle area of the County is renowned for it's historic links with witchcraft. On a lozenge gules, a lion rampant queue fourche argent, inscribed beneath on a scroll LEICESTERSHIRE all argent. The lion is derived from the arms of Simon de Montford who inherited the Earldom of Leicester. A lozenge azure, behind the Lincolnshire Imp the new Humber bridge, or. The County was formerly known as Lincolnshire North and Humberside South, the symbolism showing both the Lincolnshire Imp as found in Lincoln Cathedral, and the new Humber bridge symbolising the Humberside part of the County. The Lincolnshire Imp vert, inscribed beneath a motto band vert lettered LINCOLNSHIRE of the first. This represents the imp which is to be found carved in stone in the choir of Lincoln Cathedral. According to legend one of the imps of the devil made mischief in the Cathedral, but went too far in the choir, whereat one of the angels turned him into stone, and there he has remained ever since. A rose gules for Lancashire, inscribed beneath MANCHESTER on a scroll gules lettered or. On a Lancashire rose gules, a rose or bearing a Liver Bird vert, in the beak a branch of laver seaweed. On a lozenge gules three seaxes in pale white pomelled and hilted or, in chief a Saxon crown, or, with a scroll gules, lettered EAST or. Middlesex formerly used the arms assigned to the kingdom of the Middle and East Saxons - the three notched swords or Seaxes, alluding to the theory that the Saxons' name was derived from these weapons. In the 9th Century England was divided into Kingdoms such as Essex, Wessex, Sussex. Alfred determined that the capital of his Kingdom should be London, and he took a portion of each of the surrounding kingdoms to form Middlesex. His grandson Athelstan was the first English king to introduce the crown onto the coinage. On a lozenge gules three seaxes in pale white pomelled and hilted or, in chief a Saxon crown, argent. A lozenge per fess blue and green. The 15th century lantern tower of the Cathedral Church of St Nicholas, Newcastle Upon Tyne a scroll lettered NEWCASTLE UPON-TYNE argent. The figure of Britannia above a curved scroll inscribed with the word NORFOLK, all or. In 1923 the then Colonel of the Norfolk Regiment gave permission for the Guides of Norfolk to use Britannia, which was then the Regimental Badge, providing that it was not identical, thus a scroll was added bearing the County name. When Britannia was first drawn in 1665 she held a spear in her left hand and an olive branch in her right. In 1797 she was shown holding a trident rather than a spear, and she was later provided with a helmet. A roundel azure, thereon a three masted schooner vert, rigged argent sails white, flags azure charged with a cross throughout gules, all fimbriated argent. A Tudor rose gules on argent, barbed vert. The Tudor rose has been used as the Northamptonshire County Seal since at least 1665. This is unusual, as it is usually shown as white on red, but indicates the associations the county has with the houses of both York and Lancaster. Saint and King Oswald in martial array, crowned and bearing a sword in his right hand and a cross in his left all or wearing a mantle gules, lined azure, in a roundel azure with trefoils or. St Oswald was a seventh century King of Northumbria and disciple of St Aidan. A bugle-horn garnished and stringed all or. This represents the hunting grounds in the County, and may also be linked to the legend of Robin Hood and Sherwood forest. White, an ox gules fimbriated sable, passing over a ford of water in base barry wavy of 6 azure and white. The arms of the City and County of Oxford, differenced by placing the arms on white rather than argent. The badge uses punning symbolism in featuring an Ox crossing a ford. On the White Rose of Yorkshire a roundel azure bearing 2 arrows in saltire points downwards, white behind a garb or. The name Sheffield derives from the River Sheaf and a field - the river is denoted by the blue of the roundel, the arrows represent the cutlery and steel products of Sheffield, and the garb or sheaf of corn is a rebus on the name Sheffield. Or, semee of ermine tails azure (three piles of the second two issuant from the chief and one in base each charged with a leopard's face or, inscribed beneath with the County motto FLOREAT SALOPIA sable. this is similar to the arms of the County Council, but is differenced by the colours of the ermine tails, those of the County Council being sable. The first known use of the knot is on a seal which belonged to Joan, Lady Wake, in the first half of the fifteenth century. She was descended from Hereward, who's badge was the Wake Knot, make of two monk's girdles knotted together to form the letter W. On Lady Wake's death her possessions passed to her nephew Humphrey, Earl of Stafford, who took the knot of rope as his own badge, and from that time it was known as the Stafford Knot. A key hanging from a chain, or. This is taken from the coat of arms of the Suffolk Regiment, in memory of the Siege of Gibraltar ('the key to the Mediterranean'). It was chosen as the County badge as a symbol of honesty and trustworthiness, and as a reminder that the key to happiness is service to others. A lozenge azure on water in base, a pear tree fructed sable, leaved vert in front of a range of hills vert, all fimbriated or, inscribed beneath on a scroll lettered WORCESTERSHIRE all or. This is said to derive from the arms designed to mark the visit of Queen Elizabeth to the city, when the loyal folk transplanted a tree under fruit from it's orchard to the centre of the city and she is said to have exclaimed 'oh what honest people the Worcester people are!' in seeing the fruit of the tree apparently untouched.